"This is Cindy's first new release in almost a decade. She goes back to an earlier style of Folk Bluegrass, with a bit of a pop flavoring, featuring several duets - one with Andrew Peterson. Listening to this album is a storied affair where our souls are awakened to the healing of God's truth as Cindy wrestles with how life's hurts ultimately find their rest in Jesus Christ." My mother bought this CD unexpectedly and put it on for me to listen to. The both of us fell in love in an instant. Cindy has an incredible, soothing voice. Her work is enveloped in beautiful harmony, and her lyrics are poignant and touching. Such comforting melody. It's playing in the store these days, to the utter delight of my heart. For more information on the CD, Bows & Arrows by Cindy Morgan, visit our website here. I am always grateful for the series that put the book number on the binding. 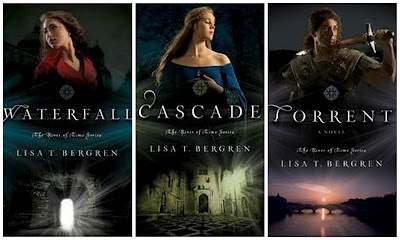 Lisa Bergren has a gift for writing youth fiction. Reading it now, it holds everything my teenage heart absolutely adores. A little too immensely. A smattering of history, a dash of time travel, heaps of action and intensity, and a steady throw of romance. Some of my favourite medieval stories involve a present day kid being thrown back into the times of knights and kings and castles. Those are the stories that got me reading incessantly, and the stories that inspired me to write. I am so glad I came upon this series. I would classify it as a bit of a guilty pleasure - medieval romance and fashion-culture-faux-pas are really what get me going, and the sparring, target-practice, horse-riding, armour-laden lovelies really do manage to hold my attention. This is what I read for a good dosage of drama and fantasy. In the River of Time series, sisters Gabriella (Gabi) and Evangelia (Lia) Bettarini travel back in time to 14th century Italy, into a fight for their lives that they would never have expected or anticipated in their wildest daydreams. I have read these first three books (over the course of a weekend. Easter weekend, if you can believe I had the time. I made the time) but there are apparently two novellas and another, final, book to the series, tying everything into a nice bow or something. I'm waiting on that last book, too nervous to start for fear of ending the series for myself. I don't like the idea of it all being over - I get that way with series. It just means I truly enjoyed them. Lisa keeps you guessing. Sometimes a little, other times a lot. Yes, you pretty much know that Gabi will fall for so-and-so, but whether or not they'll end up together - that's a path strung with doubt from beginning to end, really. So dramatic. So tense. Perfetto. Originally when the sisters travel back in time, they're separated. Gabriella finds herself very much alone, facing a raging battle between raging Italians, an old form of Dante-Italian that she miraculously knows well enough, no one to panic with, and no way out. Her sister Lia shows up about a week to ten days later, but a lot can happen in that amount of time. Battles are fierce and numerous, the suspense is delicious, and though the save and rescue scenes are wonderful, the strong-independent-female-main-character stance is satisfying for me as well. A good balance. The best of both worlds. This book is really one for the romantics, knight-in-shining-armour nuts, sword-wielders, bow-slingers. I don't know how it does for historical accuracy or cultural appropriateness - you can only do so much in fiction, and change what you will. The world you write is yours. I don't mind too much if the details don't all match up. Fair warning. I read it for the time travel, and yeah, the romance. For all of those intents and purposes, it suited me perfectly. 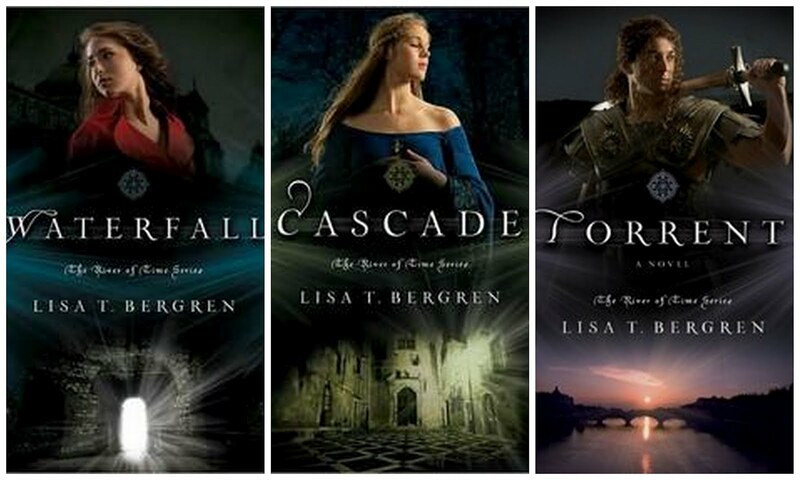 I recommend this series so very highly to anyone looking for a weekend escape into 14th century Italy, battle, drama, and romance. For more information on The River of Time series, visit our website here. My heart is broken and my eyes should be swollen. This book may as well have brought me to tears - happy tears, horrified tears, agonized tears - with how much it crushed my heart and delighted me. Only to crush my heart again. It is a veritable roller-coaster of raw, real emotion, and beauty, and pain. Lots of pain. But it's completely worth my emotional trauma because of how beautiful it is. For Such a Time, written by Kate Breslin, is an allegory for the story of Esther. Each chapter begins with a verse from the book of Esther that somehow will apply to the following pages. Chapter one introduces Stella Muller - which, we quickly discover, is a pseudonym from a set of false papers for a Hadassah Benjamin. And she is locked in a small chalet bedroom, trembling for fear, fearing for her life with each breath, communicating her terror with awful memories and inescapable emotion. She is fresh out of the Dachau concentration camp, a victim of Nazi brutality, saved directly from a firing squad line-up. Wondering why she wasn't shot; why she was "saved", if she was saved at all, or if she was only rescued from one evil to become entangled with another by the name of SS Kommandant Colonel Aric von Schmidt. He pulls her from the line-up, hides her in his cousin's home, and then comes to take her to his residence, employed as his secretary, outside the walls of the transit camp he oversees - Theresienstadt in Czechoslovakia. Her Aryan looks save her from overbearing scrutiny, and her Nazi employer keeps her from the camps, but her Jewish roots embalm her in lies that, every second, she fears will unravel. And the interest that the Kommandant has for her only keeps her more on edge. The edge of danger in this story is so sharp and crisp and clear, on each and every page, never giving a moment's peace. The only time I put this book down was when the emotions were too much for me and I needed a moment to breathe and remind myself that I was, really, just reading a book. It does go into some gruesome detail about the Holocaust and the horrors there, and I would not recommend this to the faint-at-heart or those more sensitive to brutality. This book is so brutally well-written. The emotions and characters, so painfully raw and captivating. Her prose is littered with German and Yiddish words and phrases, for the language lovers. Her plot is intertwined with strands of beautiful romance, for the hopeless romantics (tastefully done). And every inch of every page - every word of every phrase - is utterly captivating. Stella Muller - Hadassah Benjamin - you break my heart. For more information on For Such a Time by Katie Breslin, visit our website here.